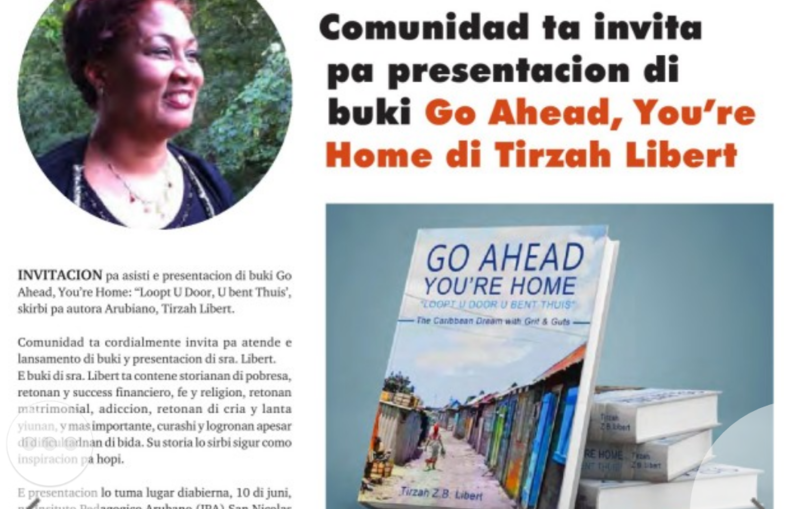 You are cordially invited to attend the Aruba book launch and presentation of Ms Tirzah Libert’s newest publication, her autobiography, entitled Go Ahead, You’re Home: “Loopt U Door, U Bent Thuis”. 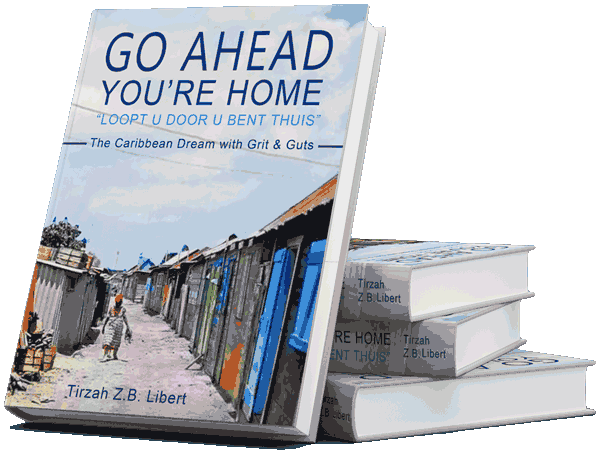 The Aruba born and Curacao raised author’s story is compelling in every sense of the word, as it includes stories of poverty, financial and business challenges and successes, faith and religion, marital challenges, addiction, challenges of raising children and most of all of bravery and accomplishment despite life’s hurdles. Her story will definitely serve as an inspiration. Sala Madonna starting at 7 PM. Tirzah Libert was born in Aruba and spent the earlier part of her life in The Village (North) San Nicolas. Later she and her family moved to Curacao where she eventually became a business woman owning and directing her own publishing company Liberty Publications which produced the in-flight magazine of ALM “TradeWinds” in the 90s and later Colorszine magazine. As a kid she attended Jackson Church (now Seed of Life Ministries) in San Nicolas. She is the 5th child of Kenneth Libert (famed pianist and organ mechanic of the Antilles) & Sarah Libert Vanterpool, and granddaughter of the late Joseph and Maud Liburd Heiligers) who owned a grocery store in The Village. Mr Joseph Liburd was known in Aruba for selling goods on a donkey (Jimbo) in San Nicolas. Her life’s purpose, she says is to serve and please God by living The Golden Rule: “Do unto others, as you would have done to you”. I challenge myself by stepping out of my comfort zone into my courage zone, breaking boundaries, maximizing opportunities. This is my story of Aruba Village North where I was born and partly raised. During several phases of my life I felt shame and embarrassment about the place where my cradle stood. Even as a young adult I didn’t want to be identified and associated with the village and its impoverished lifestyle. However, as I’ve matured, growing older and wiser both spiritually and mentally, I can now loudly proclaim that I’m not ashamed of the village where I was born! As a matter of fact, I take pride in sharing this part of my past with the world!